Up until now we have heard lots on the X10 mini, but not much on its QWERTY-enabled cousin, the X10 mini pro. The X10 mini is already out in some markets but you’ll have to wait a little longer for the X10 mini pro. 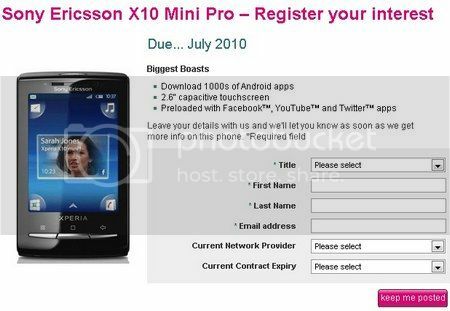 T-Mobile UK recently updated their ‘Coming Soon’ page to include the X10 mini pro and revealed that it will be arriving at some point in July. There’s not much more than that right now, but I’d expect other operators to also offer the X10 mini pro in the coming weeks.